Unlike bamboo or plastic cocktail picks, these stainless steel picks will last a long life. 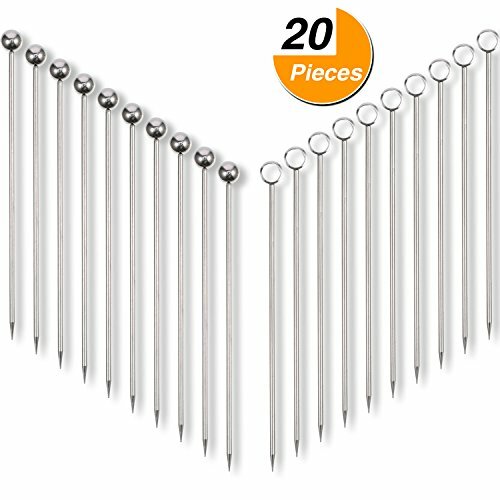 Stop throwing away toothpicks and use this stainless steel picks, which both useful and decorative, good addition to your bar. These fruit picks are both beautiful and useful, provide a fine presentation for thousand kinds of creative cocktail garnishes. These cocktail picks are suitable for using behind craft cocktail bars, for fruit stick at home, or any other occasions. Prongs included, away from children under 3 years old. Small balls included, please don't put in mouth. The small balls and the picks are welded, please use gently. If you have any questions about this product by Frienda, contact us by completing and submitting the form below. If you are looking for a specif part number, please include it with your message.